It’s been a rough couple weeks in our community, but I have some positive news. I have sidewalks AND almost have parking!! I think it’s a miracle….just imagine having to spend your first summer in business with construction in front of your shop with limited access. It’s been a trip…literally. I’ve had some fun with it from “walk the plank” sales to jokes about mandatory clothing for the workers. It’s all in a day of fun in Vape Life as far as I’m concerned. I have decided to turn your attention to a vendor from Southern California where every bottle leaves their ISO 7 Certified Facility guaranteed using only the best American-made ingredients and the perfect ratio of VG & PG for maximum flavor. I love the bright white labels and the anchor design! As always though, I’m about the flavor and SoCo is all about the flavor, so let’s get to it!! undertones of bourbon that pop into the rich vanilla flavorings in the inhale. The splash of coconut occurs for me right before the exhale and continues throughout the exhale adding a nice addition of flavoring. The exhale is a wonderful blend of flavors and I do get a nutty flavoring, but just a tad of the amaretto. Coastal Butter is a hit from start to finish and it pairs well with coffee and I imagine would go well at any time of day with any kind of beverage. I will be testing this theory out….JS. I think everyone should try this, but if you are partial to custards and tobacco blends, this will be more geared towards your palate. The throat hit is mild and the vapor production is excellent!! I will be using my HexOhm V2.1 with a Popeye RDA and a .3 ohm coil build for these reviews. I enjoyed this best at 60 watts, but it really tasted good all over the place!! As always, I do re-wick between each blend. the cream in the inhale. So much so, that it reminds me of a creamy strawberry fluff dessert made of whipped cream and a strawberry jello. 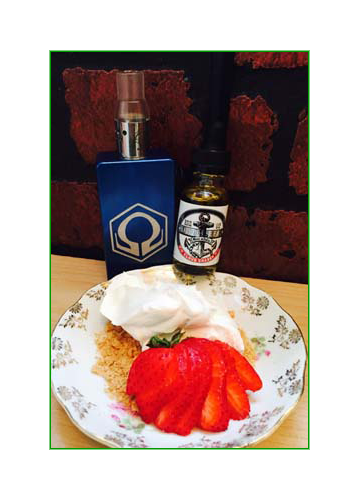 If I would chop up some fresh strawberries in this recipe and add a graham cracker crust, I may be able to replicate the flavor of this eLiquid. The notes of the graham are evident throughout the vape and pop in before the exhale and blend in throughout the exhale. The flavor is smooth and not overly sweet, but I personally would like a touch more of the strawberry. For there to be four different types of strawberry, I expected the berry to really shine and it was the muted flavor in this blend. That’s not necessarily a bad thing when it’s paired with other good flavorings, a mild throat hit, and excellent vapor production. I enjoyed this best at 60 watts as well. Lucky Charm is a different take on this famous cereal in my opinion. It is a tad sweeter than most I have tasted and I almost note a touch of citrus in the inhale. I am not crazy about this extra flavor in the inhale, if it is citrus. Some of you may enjoy it though and the rest of the vape is pretty tasty. The cereal flavoring and cream isn’t that bad, and it is a nice, smooth vape. The exhale is like a bite of the marshmallows in the milk with a note of the cereal. That is my favorite part of the vape. The throat hit is mild and the vapor production is excellent with this one too. I also liked this at 60 watts. in it to be honest usually has a weird note of flavoring in it that always seems off. While it took me a little while to get used to Purple Hitter, this eliquid is nicely balanced. 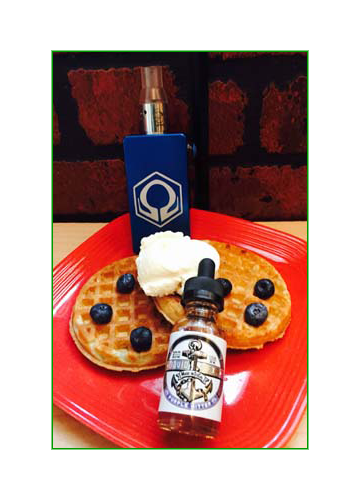 On the inhale, the wild blueberry flavor is quite good and the waffle undertone adds just the right touch. The vanilla custard adds a nice smoothness and sweetness to the eLiquid that rounds it out throughout the entire vape. The more I vaped it, the more I enjoyed the blend of flavors. I messed around with the wattage on this one too and I enjoyed it everywhere from 40-60 watts. I’m sure I could have even gone higher with it. Purple Hitter is another eLiquid well done by Liquid EFX with a mild throat hit and great vapor production. Drip Diver is a nice, fruity flavored vape that is really smooth. 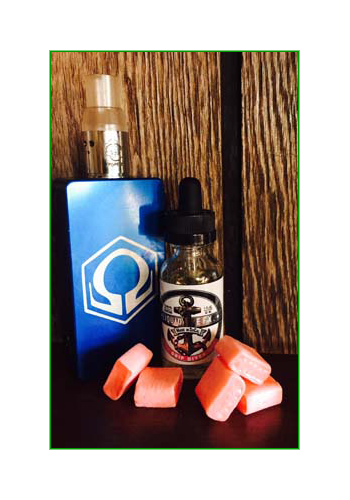 On the inhale, a delicious blend of strawberry and watermelon with a tad of kiwi that really makes the flavor pop. The blend really mixes well together for the exhale. The throat hit is mild and vapor production is excellent with Drip Diver too. Fruit vape lovers will definitely enjoy this one, but if you enjoy those candies they are talking about you may want to try it as well. I preferred this one around 50 watts. Coil Candy has that sweet watermelon inhale with a little bit of a tangy watermelon throat hit to it. The watermelon flavoring is really tasty and I like the twist and tang in with it to make it more like the candy. The flavor lasts throughout the exhale and even though the flavor sticks in the back of my throat a bit, I don’t seem to mind it. Watermelon vape lovers will be all over this one. I seemed to prefer this one around 50 watts as well and the vapor production was just as good as the rest of the line. Liquid EFX has a pretty solid line up of flavors and you should find a B & M near you to try some out! Check out their retail locations on their web site: LIQUID EFX. The eliquid comes in 30ml glass bottles with shrink wrapped child proof glass droppers. It is available in 3mg, 6mg, and 12mg nicotine strengths, as well as zero-nicotine. Follow them on Facebook at Liquidefx Vape or Instagram @liquidefxvape.